Designer nucleases such as zinc finger nucleases (ZFNs) and transcription activator-like effector nucleases (TALENs) can be used to modify the genome of mouse preimplantation embryos by triggering both the nonhomologous end joining (NHEJ) and homologous recombination (HR) pathways. These advances enable the rapid generation of mice with precise genetic modifications. Hermann, M., Cermak, T., Voytas, D. F., Pelczar, P. Mouse Genome Engineering Using Designer Nucleases. J. Vis. Exp. (86), e50930, doi:10.3791/50930 (2014). Transgenic mice carrying site-specific genome modifications (knockout, knock-in) are of vital importance for dissecting complex biological systems as well as for modeling human diseases and testing therapeutic strategies. Recent advances in the use of designer nucleases such as zinc finger nucleases (ZFNs), transcription activator-like effector nucleases (TALENs), and the clustered regularly interspaced short palindromic repeats (CRISPR)/CRISPR-associated (Cas) 9 system for site-specific genome engineering open the possibility to perform rapid targeted genome modification in virtually any laboratory species without the need to rely on embryonic stem (ES) cell technology. A genome editing experiment typically starts with identification of designer nuclease target sites within a gene of interest followed by construction of custom DNA-binding domains to direct nuclease activity to the investigator-defined genomic locus. Designer nuclease plasmids are in vitro transcribed to generate mRNA for microinjection of fertilized mouse oocytes. Here, we provide a protocol for achieving targeted genome modification by direct injection of TALEN mRNA into fertilized mouse oocytes. Mice are by far the most popular platform for generating transgenic animal models. The versatile toolbox for genetic engineering of the mouse embryo1-3 has been recently extended by genome editing approaches based on designer nucleases such as zinc finger nucleases (ZFN)4-6, transcription activator-like effector nucleases (TALEN)7,8, and the clustered regularly interspaced short palindromic repeats (CRISPR)/CRISPR-associated (Cas) 9 system9. ZFN and TALEN function as pairs of two custom-designed protein-based DNA-binding domains (arrays of zinc finger proteins and repeat-variable di-residues (RVDs), respectively) that are each coupled to the FokI endonuclease10-12. Conversely, the specificity of Cas9-mediated DNA cleavage is provided by transactivating CRISPR RNAs (crRNA and tracrRNA, which can also be combined into a single chimeric RNA molecule termed guide RNA)11 that act in a complex with the CRISPR protein. TALENs with a defined sequence of RVDs can be rapidly constructed by individual experimenters with a multitude of assembly strategies to choose from13-17. CRISPR/Cas9 promises even less labor-intensive generation of designer nucleases, however the specificity of guide RNA-DNA binding is still not completely resolved18,19. Generation of custom ZFNs has so far been limited to specialized academic laboratories and to commercial suppliers such as Sangamo Biosciences and the Sigma CompoZr service. In general, genome editing with designer nucleases aims at introducing double strand breaks (DSB) at defined genomic loci, which subsequently attract nonhomologous end joining (NHEJ) or homologous recombination (HR) DNA repair machineries10,12. NHEJ-mediated repair of a DSB often results in the introduction of insertions and deletions in close proximity to the site of repair. Thus NHEJ repair can be exploited for knocking out the function of a target gene by introducing a frame-shift mutation within the genes protein-coding sequence4,7,9. Alternatively, defined addition or replacement of genetic information can be achieved by providing a DNA donor together with the designer nucleases. A DNA donor comprises investigator-designed DNA sequences flanked by regions of homology with the target locus, thus serving as a template for DSB repair by HR. Both plasmids5,6,20 and single-stranded oligonucleotides8,9,21 have been successfully used as donors. Neither NHEJ- nor HR-mediated genome editing require the introduction of a selectable marker into the genome of the mouse embryo, which makes these strategies particularly well suited for creating small alterations in the nucleotide sequence without disturbing the overall genetic architecture. In this protocol we describe all essential procedures for genome editing in the mouse embryo using TALENs. These include 1) identification of a TALEN target site22, 2) construction of TALENs by golden gate cloning13, 3) in vitro synthesis of TALEN mRNA, 4) microinjection of TALEN mRNA into fertilized mouse oocytes, 5) surgical procedures for embryo transfer, and 6) analysis of TALEN-induced mutagenesis in founder animals. We focus on TALEN mRNA microinjection and screening of founders for NHEJ-induced insertions/deletions. For this purpose we have generated bifunctional TALEN constructs that allow both expression in mammalian cells when transfected as plasmids and in vitro synthesis of TALEN mRNA for microinjection into mouse embryos. These constructs comprise a truncated TALE backbone23 fused to heterodimeric FokI domains24,25 for optimal genome editing in mammalian cells. This protocol can also be adopted for microinjection of other designer nucleases or for combined injections of designer nucleases and donor constructs (design of DNA donors has been described in excellent technical publications by Wefers et al.26,27). All animal experiments were performed in accordance with the guidelines and regulations of the Cantonal Veterinary Office of Canton Zurich. Visit the TAL Effector Nucleotide Targeter 2.0 website (http://tale-nt.cac.cornell.edu) and choose "TALEN Targeter". Enter the sequence of the target gene. If pCAG-T7-TALEN expression constructs is being used (Figure 1C) choose "Miller et al., 2011" under "Use a Preset Architecture" in order to predict target sites that can be targeted with the optimal spacer length (15-20 bp) and numbers of TALE RVDs (15-20) for this TALEN architecture. Choose "NN" under "G Substitute" (Guanosine-specific NH RVDs are also available but not yet extensively tested for TALEN assembly). Optional: for other settings and options please follow the instructions on the website and the links provided there. A textfile with potential target-sites is generated, which can be imported into a spreadsheet program for more convenient viewing. Select the TALEN pair(s) for Golden Gate assembly. Optional: Sequence the genomic region of interest in the mouse strain that will be used for microinjection to detect possible single nucleotide polymorphisms (SNPs) that might not be accounted for in public databases and could potentially prevent nuclease binding. Optional: Refer to Table 3 for additional designer nucleases-related online resources. Addgene IDs for the Golden Gate TALEN kit and mammalian TALEN expression constructs are provided in Table 2. Alternatively, particular functional modules such as zinc finger domains can be ordered from a gene synthesis service provider. This section describes the assembly of TALENs using a protocol published by Cermak et al.13 Full-length TALENs are constructed using two subsequent Golden Gate cloning steps (Figure 1). This approach allows the incorporation of any number of RVDs between 12 and 31 into the final expression constructs. The assembly protocol has been adapted to destination vectors designed for generating mRNAs (Figure 1C) that express highly active TALENs following oocyte microinjection. Please also refer to the online protocol of the Golden Gate TALEN kit for establishing and maintaining the plasmid library (http://www.addgene.org/TALeffector/goldengateV2/). Optional: For each TALEN pair designed in Protocol 1, enter the DNA sequence of the two the target sites (including the initial T, 5' to 3') into the TALEN_Voytas_Pipetting spreadsheet to generate a pipetting scheme for each Golden Gate reaction (also enter concentrations of all plasmids used for the assemblies). The spreadsheet also provides the expected DNA sequence of all RVDs that can be used for alignment of sequencing results in section 2.5.2. If TALEN length is 12-21 (standard), select repeat variable di-residues (RVDs) 1-10 and destination vector pFUS_A. Select remaining RVDs and a pFUS_B destination vector, e.g. for a TALEN with 15 RVDs (including the last repeat, which will be added to the final assembly in section 2.3.3, select RVDs 11-14 and destination vector pFUS_B4 (Figure 1A). If TALEN length is 22-31, use RVDs 1-10 and destination vector pFUS_A30A. Pick RVDs 11-20 and destination vector pFUS_A30B. Select remaining RVDs and a pFUS_Bdestination vector, e.g. for TALEN with 24 RVDs pick RVDs 21-23 and destination vector pFUS_B3. Place Golden Gate reactions in a thermo cycler. Add 1 µl 10 mM ATP and 1 µl Plasmid-Safe nuclease to each mix and incubate at 37 °C for 1 hr. This treatment will remove linear incomplete ligation products that could be cloned into the destination vectors by in vivo homologous recombination in transformed bacteria. Transform E. coli with individual ligation reactions (electrocompetent or chemically competent E. coli that facilitate α-complementation such as XL1-Blue or DH5α can be used here and in subsequent transformations). Plate bacteria on spectinomycin (50 µg/ml) plates with X-Gal and IPTG (40 µg/ml each) for blue/white colony selection. By using colony PCR with primers pCR8_F1 and pCR8_R1 (See Table 1 for primer sequences) screen 1-3 white colonies from each plate. Correct pFUS-RVDs assemblies typically show a band corresponding to the combined length of all RVDs cloned (e.g. around 1.1 kb for 10 RVDs) and a "ladder" of smaller less prominent bands (Figure 1B). Use confirmed clones to start overnight culture (2-5 ml LB with 50 µg/ml spectinomycin). Perform "minipreps" to isolate pFUS-RVD assemblies (depending on number of RVDs either pFUS_A and pFUS_B or pFUS_A30A, pFUS_A30B, and pFUS_B). Optional: Sequence individual pFUS vectors using primers pCR8_F1, pCR8_R1 (see Table 1 for primer sequences). Sequencing can also be performed on final TALEN constructs (section 2.5.2); however, for longer TALENs complete reads of all RVDs might not be possible using Sanger sequencing. Set up Golden Gate reaction #2 for each single TALEN. 150 ng of each pFUS vector, 150 ng of pLR-HD, pLR-NG, pLR-NI, pLR-NN (last "half-repeat") according to the design of the RVD sequence and for the left TALEN use 75 ng of pCAG-T7-TALEN-ELD-Destination and for the right TALEN use 75 ng pCAG-T7-TALEN-KKR-Destination (or vice versa). Add 1 µl Esp3I, 1 µl T4 DNA ligase, 2 µl 10x T4 DNA ligase buffer, H2O to 20 µl total reaction volume. Use reactions from section 2.3.4 to transform E. coli. Screen 1-3 white colonies from each plate by colony PCR with primers TAL_F1 and TAL_R2 (see Table 1 for primer sequences). Correctly assembled TALENs show a PCR product with a length corresponding to the total number of RVDs incorporated (Figure 1D, this band is sometimes difficult to detect while the "ladder effect" represents a robust indicator of successful assembly). Use confirmed correct clones to start overnight bacterial cultures (2-5 ml LB with 100 µg/ml ampicillin). Perform "minipreps" to isolate pCAG-T7-TALEN plasmids. If sequencing was not performed in section 2.3.2, use primers TAL_Seq_5-1 and TAL_R2 (see Table 1 for primer sequences) to determine correct RVD assembly in full-length TALEN. Prepare high quality midi or maxipreps of pCAG-T7-TALEN plasmids for mRNA synthesis. Linearize 10 µg of the TALEN or ZFN mRNA synthesis plasmid using a restriction enzyme that preferentially cleaves downstream and in close proximity to the nuclease STOP codon (for pCAG-T7-TALEN vectors use SacI). mRNA synthesis plasmids typically include a T7 or SP6 phage promoter upstream of the nuclease coding sequence. Run 200-500 ng of digested plasmid on a 0.7-1% agarose gel to check for complete digestion. Remove salts from plasmid digest by precipitating the DNA with 0.1 volume sodium acetate and 3 volumes ethanol for 1 hr at room temperature. Pellet the DNA by centrifugation at 14,000 x g or more for 10 min, wash the pellet with 200 µl 70% ethanol, spin for another 5 min, remove the ethanol, air dry the pellet and resuspend in an appropriate volume of RNAse-free water. Purification of the linearized plasmid is also possible using a column-based system, e.g. QIAquick PCR Purification Kit. Determine the concentration of the linear template and use 1 µg to set up in vitro transcription. For in vitro transcription of pCAG-T7-TALEN plasmids use the mMESSAGEmMACHINE T7 Ultra Kit. Set up the transcription reaction for each TALEN on ice: to 20 µl with nuclease-free water, 10 µl T7 2x NTP/ARCA, 2 µl 10x T7 Reaction Buffer, 1 µg of DNA template, 2 µl T7 enzyme mix. Mix the reaction and incubate for 1-2 hr at 37 °C. Use the complete 20 µl transcription reaction mix to set up the polyadenylation reaction on ice: 36 µl of nuclease-free water, 20 µl 5x EPAP buffer, 10 µl 25 mM MnCl2, 10 µl 10 mM ATP. Mix and remove 2.5 µl of the reaction mix as control samples L1 and R1 (for left and right nuclease, respectively). Add 4 µl of E-PAP enzyme and incubate the reaction for 45-60 min at 37 °C. Remove another 2.5 µl of reaction mix as control samples L2 and R2. Use NucAway Spin Columns for mRNA purification (buffer exchange and removal of unincorporated nucleotides). Tap columns to settle dry gel in the column's bottom. Hydrate column with 650 µl of RNAse-free microinjection buffer (1 mM Tris-Cl, 0.1 EDTA, pH 7.5). Cap, vortex, tap out air bubbles, and hydrate for 5-15 min at room temperature. Place the column in a collection tube and spin at 750 x g, 4 °C for 2 min to remove excess interstitial fluid. Discard collection tube and place column in a 1.5 ml elution tube. Apply complete reaction mix from section 3.2.2 to column and spin at 750 x g, 4 °C for 2 min. Nuclease mRNA will now be dissolved in microinjection buffer. Remove 2.5 µl of purified samples L3 and R3. Store mRNA at -80 °C until microinjection aliquots are prepared. Clean a gel chamber to remove RNAse contaminations using 10% SDS solution or RNaseZAP. Prepare a 1% agarose gel in 1xTBE running buffer. Mix each RNA sample L1/R1, L2/R2, L3/R3 with 3 volumes of NorthernMax Formaldehyde Load Dye and incubate for 15 min at 65 °C. Load samples and a RNA size ladder (e.g. RNA Millennium size marker) on the gel and run gel at 10 V/cm in 1x TBE until loading dye reaches the end of the gel. Stain the gel using SYBR green solution (Invitrogen) for 30-60 min with agitation at room temperature. Image the gel and compare sizes of L1/R1 with L2/R2 and L3/R3. 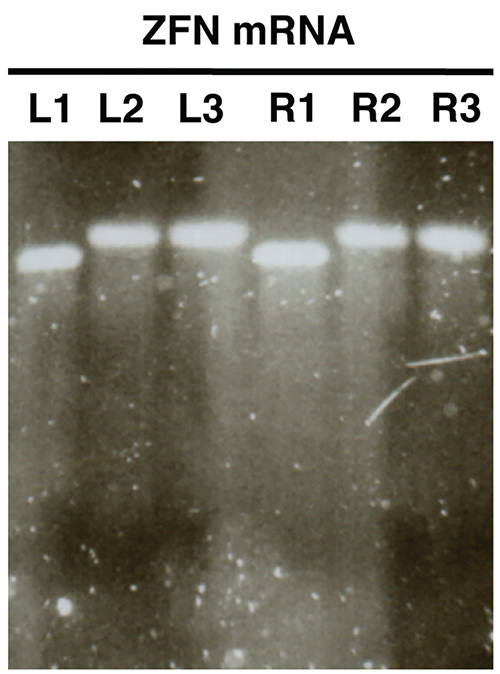 Samples L2/R2 and L3/R3 should show bands of an increased size relative to L1/R1 indicating successful polyadenylation in (Figure 2). Determine mRNA concentration using a spectrophotometer. Prepare mRNA aliquots for microinjections by mixing left nuclease and right nuclease mRNA in a 1:1 ratio. We recommend preparing aliquots with a total concentration of 200 ng/µl (100 ng/µl of each nuclease) by diluting with microinjection buffer. Store mRNA aliquots at -80 °C. Embryo Isolation. This protocol has been successfully used with C57BL/6J and BDF1 strains and can most likely be adapted to other strains commonly used in microinjection experiments such as FVB or CBF1. The mice are housed under a 12 hr-12 hr light-dark cycle in a temperature- and humidity-controlled facility with food and water ad libitum. Superovulate donor females to increase the yield of embryos. 16 females (4 weeks old) are superovulated by intraperitoneal (i.p.) injection of 5 IU pregnant mare's serum gonadotropin (PMSG), followed by i.p. injection of 5 IU human chorionic gonadotropin (hCG) 48 hr later. Mate the 16 superovulated females to 16 breeding age (2-8 months) males immediately after hCG injection. Sacrifice the females using an approved euthanasia protocol such as CO2 inhalation. Recover the fertilized oocytes. Oocytes are collected from oviducts the next morning and then freed from any remaining cumulus cells by a 3-5 min treatment in 0.1% bovine hyaluronidase dissolved in M2 medium. Depending on the mating performance and the strain used the embryo yield may vary. 16 C57BL/6J females usually produce 150-250, whereas BDF1 yield 300-400 fertilized oocytes, respectively. Inject the nuclease mRNA. Pronuclear stage oocytes are typically injected in the early afternoon. Cytoplasmic mRNA microinjection is carried out in M2 medium under mineral oil using an inverted microscope equipped with Nomarski DIC using 20X objective and with embryo micromanipulators as well as an injection unit. We recommend commencing the injections of TALEN mRNA at a concentration of 10 ng/µl (20 ng/µl in total). Aspirate the oocyte with a holding capillary and inject the nuclease mRNA in the cytoplasm of the embryo avoiding contact with the pronuclei. The injection should be shallow, close to the plasma membrane. The injection volume should be kept low and the microinjection needle should be withdrawn at the first sign of cytoplasmic distension. A microinjection series will normally consist of 100-300 oocytes. Typically, at least 80-90% of the embryos should survive the injection without immediate lysis. Following microinjection, place the embryos for 1 hr in M16 (Sigma) medium at 37 °C and 5% CO2 and transfer the surviving embryos into pseudopregnant foster mothers. Prepare pseudopregnant embryo recipients (foster mothers) one day before mRNA microinjection. Mature females (3-6 months old) of a robust outbred strain, such CD-1, are well suited for the role. Induce pseudopregnancy by mating the females on a previous day with either surgically or genetically vasectomized males28. Only 0.5 dpc females with a clear copulatory plug are used as embryos recipients. In unused females the pseudopregnancy disappears after around 3 weeks allowing their repeated use. Anaesthetize the 0.5 dpc foster mother females by i.p. injection of ketamine, xylazine (120 mg/kg and 16 mg/kg, respectively). This formulation guarantees ~30 min surgical tolerance time is more than sufficient for the projected operation time of 5-10 min. Position the anaesthetized animal on its abdomen on a warm surface and disinfect the area of incision with an appropriate disinfectant such as 70% ethanol or chlorhexidine and alcohol mixture. Incise the skin on the back of the animal and open the peritoneal cavity with sterile scissors. Visualize and externalize the uterine horn by pulling on the fat pad attached to the ovary. Keep the organs moist using warm 0.9% NaCl solution. Keep in mind that the surgical site may have to be draped with sterile dressing or shaved in order to conform to local veterinary guidelines. Immobilize the reproductive organs by clipping the ovary fat pad with a bulldog clamp. Gently grasp the oviduct just upstream of the ampulla with watchmaker forceps and use a 30 G hypodermic needle to create a small hole in the oviduct wall. Withdraw the needle and reinsert a thin glass capillary containing the embryos into the hole allowing the placement of the embryos in the ampulla by gently blowing into the mouthpiece of the capillary holder. Withdraw the capillary once the embryos are deposited in the ampulla and replace the reproductive organs back in the body cavity. Close the peritoneal cavity with a series of sterile sutures (Prolene 6-0). Close the skin using 1-2 wound clips (Autoclip 9 mm) depending on the size of the opening. Following the operation return the animals to their home cage and supervise them until the effect of anesthesia wear off. In order to minimize stress, house the mice in stable social groups (2-4 animals/type III cage) whenever possible. Apply post-operative analgesics in the form of Dafalgan added to the drinking water (Paracetamol 200 mg/kg BW) for 3 days after the surgery. Design primers to amplify a region between 200-700 bp around the nuclease binding site. The distances forward primer-nuclease spacer region and nuclease spacer region-reverse primer should be sufficiently different to allow detection of two separate bands for digested products on an agarose gel (see Figures 3 and 4 for examples). Run PCR with optimized conditions. Check PCR amplicon size on an agarose gel. Optional: Purify PCR products, e.g. with QIAquick PCR Purification Kit to remove salts and nucleotides from the PCR mix. Many restriction enzymes are active in PCR samples complemented with the appropriate restriction enzyme buffer and purification is not needed. We have also successfully used T7 endonuclease in QiagenTaq PCR buffer complemented with NEBuffer 2. Restriction digest of PCR product. Mix 17 µl of PCR product with 2 µl of 10x restriction enzyme buffer and 1 µl of restriction enzyme. Digest at appropriate temperature for 1 hr or more. Add DNA loading dye to samples and run on a 2% agarose gel to detect distinct digestion patterns for wild-type animals and founders carrying mutated alleles. See Figures 3 and 4 for expected results. 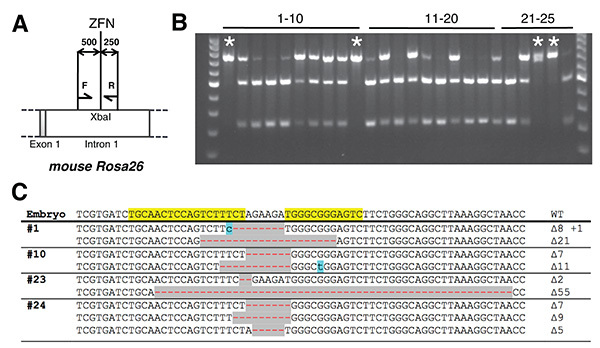 Clone PCR products of founders positive for mutated alleles for Sanger sequencing (e.g. by TA-cloning into pGEM-T Easyor directly sequence mixtures of PCR products using next-generation sequencing. We constructed destination plasmids compatible with the Golden GateTALEN assembly published by Cermak et al.13 that allow expression of TALENs in mammalian cells as well as in vitro mRNA synthesis from the T7 phage promoter (Figure 1C). 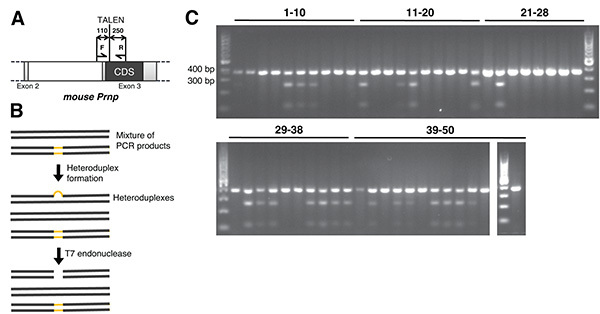 These plasmids carry heterodimeric FokI domains (ELD or KKR mutations) that have been shown to reduce off-target effects relative to FokI homodimers and to enhance cleavage activity as compared to first generation FokI heterodimers25,29. Golden gate assembly reactions #1 and #2 are usually very efficient and every white colony, when analyzed by colony PCR, shows the expected pattern for the particular number of RVDs cloned (Figures 1B and 1D). Gel analysis of in vitro synthesized mRNA (Figure 2) should reveal a single distinguishable band with little or no smear for every sample analyzed. There should be a clear size shift between samples L1/R1 and L2/R2, L3/R3, which indicates successful polyadenylation. Founder animals can be screened for NHEJ-induced mutated alleles using genotyping PCR followed by either T7 endonuclease digestion (Figure 3) or a restriction digest using an enzyme that cleaves the wild type sequence within the spacer region of the nuclease pair (Figure 4). The T7 endonuclease assay is applicable to any kind of mutation irrespective of the specific genomic sequence within the spacer region of the nuclease pair injected; however, it detects only mismatches between DNA strands in heteroduplex PCR products. Thus, in the rare event that a founder carries two identically mutated alleles, PCR products would not show any T7 digestion pattern. Such distinction is, however, always possible when a specific restriction site is located within the nuclease spacer region that will be eliminated by NHEJ-induced insertions/deletions (Figure 5). Here, undigested bands indicate the presence of mutations, and the absence of any digested products strongly suggests a founder carrying mutations in both alleles of the targeted gene (marked with asterisks in Figure 4b). Figure 1. Golden Gate cloning of TALEN RVDs into heterodimeric pCAG-T7-Destination vectors. A) Assembly of RVD arrays into pFUS vectors. Here an example is shown for a TALEN pair with individual TALE arrays comprising 15 RVDs and 17 RVDs, respectively (for TALE arrays longer than 21 RVDs, three pFUS-RVDs assemblies are required, not shown). 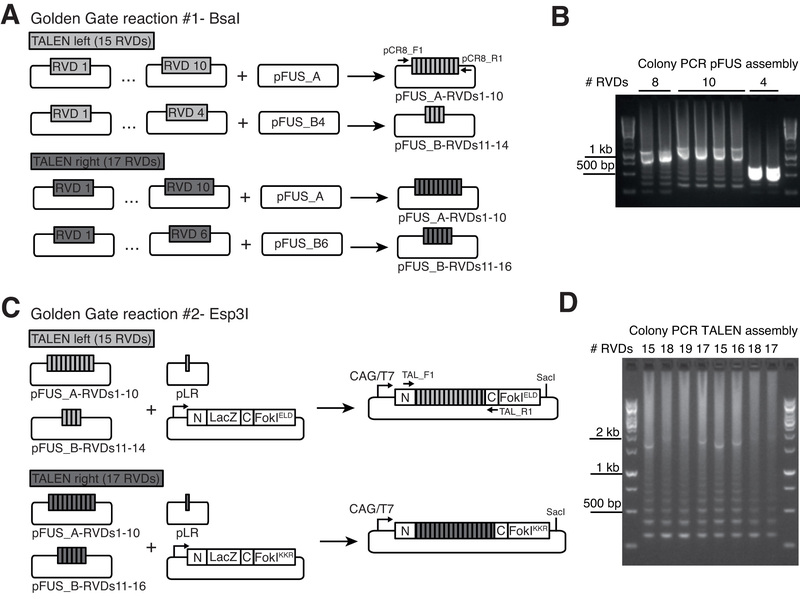 Arrows indicate primers for pFUS-specific colony PCR reactions. B) PCR products amplified from correct pFUS assemblies typically show a band corresponding to the combined length of all RVDs cloned (e.g. around 1.1 kb for 10 RVDs) and a "ladder" of smaller less prominent bands due to the repetitive nature of RVD arrays. C) Final assembly of pFUS-RVD arrays and a plasmid containing the last repeat (pLR) into heterodimeric TALEN expression vectors with FokIELD and FokIKKR variants, respectively. The TALEN backbone (annotated as N and C) resembles the architecture published by Miller et al.23 The CAG (CMV early enhancer element/ chicken beta-actin) promoter ensures high expression levels in transfected mammalian cells, while the T7 phage promoter allows in vitro mRNA synthesis (use SacI for linearization of the vector downstream of the nuclease STOP codon). D) Colony PCR using primers indicated by arrows in C) allows identification of correctly assembled TALENs. Full-length PCR products are often less prominent while the "ladder effect" represents a robust indicator of successful assembly. Click here to view larger image. Figure 2. Quality control of nuclease mRNA in vitro synthesis using agarose gel electrophoresis. ZFN mRNAs are shown as an example (L, left ZFN; R, right ZFN). Samples L1/R1 show mRNA prior to polyadenylation, samples L2/R2 show polyadenylated mRNA and L3/R3 show purified polyadenylated mRNA. Click here to view larger image. Figure 3. Example of a T7 endonuclease assay used for identification of founder animals carrying nuclease-induced mutations of the target locus. A) A TALEN pair was designed to cleave within the coding region of the mouse prion protein gene (Prnp, TALEN target sequence can be provided upon request). A PCR product is generated using a forward primer (F) located 110 bp upstream and a reverse primer (R) 250 bp downstream of the TALEN cleavage site. B) The PCR product is subsequently subjected to heteroduplex formation and T7 endonuclease digestion. C) TALEN-induced mutagenesis within the targeted genomic region of single founders is revealed by the presence of a full-length PCR product with digestion products of 250 and 110 bps. Click here to view larger image. Figure 4. Example of a restriction digest of PCR products used for identification of founder animals carrying nuclease-induced mutations of the target locus. ZFN specific for the mouse Rosa26 locus29 target a XbaI restriction site within intron 1. A) Founders were screened by genotyping PCR using a forward primer (F) located 500 bp upstream and a reverse primer (R) 250 bp downstream of the cleavage site. B) Digestion of PCR products with XbaI reveals digestion patterns indicating mice with bi-allelic mutations (marked with asterisks), mono-allelic mutations (digested and undigested bands, e.g. animal 2) and wt mice (complete digestion, e.g. animal 21). C) Sequencing of mice with potential bi-allelic modifications shows up to 3 (animal 24) distinct insertions/deletions. Click here to view larger image. Table 1. 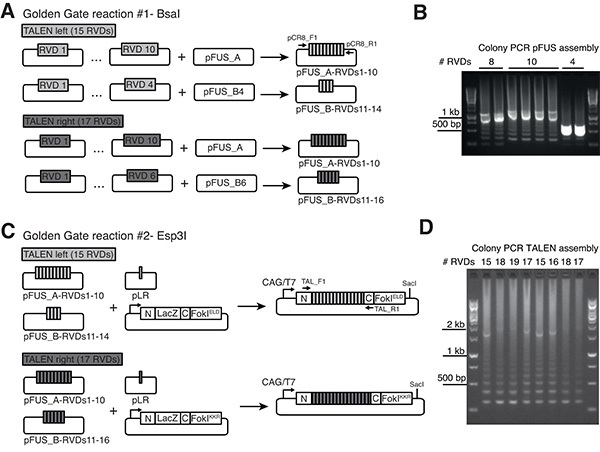 Sequences of primers used for colony PCRs and sequencing within the Golden Gate TALEN assembly protocol. Table 2. Plasmids and plasmid collections required for Golden Gate TALEN assembly can be obtained from Addgene (www.addgene.org). Table 3. Online resources for designing ZFN, TALEN, and CRISPR/Cas9. Designer nuclease-driven genome editing approaches have significantly extended the range of species amenable to targeted modifications of their respective genomes10,12. In mice, gene-targeting in ES cells has been a standard technique for over two decades; however, it has proven difficult to adapt to ES cells from species other than the mouse, although there has been some recent success in rat ES cells. Even with the availability of "off-the-shelf" gene-targeted mouse ES cell clones provided by consortia such as EUCOMM, KOMP, or NorCOMM3 genome editing by ZFN and TALEN provides higher precision and flexibility regarding the spectrum of modifications that can be introduced into the mouse genome. Founder animals carrying nuclease-mediated mutations seem to be highly germ-line competent4-6,20,21, which is not always the case for chimeras originating from blastocyst injections of ES cells. Thus, in certain cases microinjection of designer nucleases can result in significantly faster generation of novel mouse lines with targeted genome modifications. The successful generation of knockout mice by injection of ZFN and TALEN depends to a great extent on the activity of the injected nuclease pair. TALENs have been shown to have a high success rate in targeting a wide range of genes in a number of organisms; however, recent studies suggest that TALEN binding is sensitive to cytosine methylation30,31.Thus, newly generated nuclease pairs, for example TALENs cloned into pCAG-T7 vectors, can be transfected transiently into a mouse cell line such as NIH-3T3 or Neuro-2a, which mimic the chromatin state of the mouse embryo to some extent. Here, nuclease activity can be estimated using the T7 endonuclease assay or a restriction digest of PCR product as described in section 5 prior to mRNA synthesis and microinjection. We recommend sequencing of the genomic region of interest in the respective cell line and the mouse strain used for microinjection experiments. In mouse zygotes, different TALEN or ZFN pairs will work optimally at different mRNA concentrations and therefore the optimal working concentration of the microinjected nuclease mRNA may have to be determined experimentally. Depending on the nuclease pair, too low a concentration will result in no cleavage whereas too high can result in embryo lethality. Depending on the nuclease pair, we have had success using total mRNA concentrations as low as 2 ng/µl and as high as 200 µg/ul. These effects are difficult to predict from experiments in cell culture and the nuclease concentration optimal for both embryo survival and modification rate of the target locus needs to be determined empirically. Highly active ZFN or TALEN can cleave their target sequence beyond the one-cell stage of the microinjected embryo and thus cause complex patterns of mutagenesis and mosaicism in founders. We and others4 have observed three or more distinct mutated alleles in a single founder (Figure 5C). Thus, when establishing a new mouse line from these founders, offspring should be carefully screened by sequencing for the presence of the favorable mutation since digestion assays provide evidence only that an undefined mutation is present. One of the criticisms frequently voiced against the ZFN and TALEN systems is the possibility that these nucleases are also capable of cleaving sequences present somewhere else in the genome that are similar to the target sites. Such off-target effects have been observed with early generation reagents using the homodimeric FokI domain, and heterodimer constructs were designed to alleviate off-target effects25. Potential off-target sites can be predicted to some extent in silico32,33 and screened by PCR and sequencing. An obvious advantage of using ZFNs and TALENs for generating mice rather than cell lines is the possibility of removing off target mutations unlinked to desired genome modification by performing several backcrosses to a wild-type strain of choice. For the analysis of a large number of founder mice, next-generation deep sequencing of PCR products generated from the nuclease-targeted locus and in silico predicted off-target loci might offer an alternative qualitative and quantitative readout to the digestion assays of PCR products. The assisted reproductive techniques described in this protocol are optimized for standard mouse strains used for microinjection experiments such as C57Bl/6J or B6D2F1. Mice of different origins, such as outbred strains, can in principle be used for genome editing approaches and might provide a more suitable genetic background for specific research questions. The performance of assisted reproductive techniques such as superovulation can be predicted for a number of strains34-36 but might require further optimization for nonstandard strains in order to obtain a sufficient number of embryos for nuclease microinjection. Besides ZFN and TALEN, new designer nucleases such as the RNA-guided CRISPR/Cas9 system9,37,38 have now been introduced for genome editing applications. All methods for microinjection and analysis of founder animals described here are also applicable to CRISPR/Cas9 and future modes of genome editing. We would like to thank Monika Tarnowska, Cornelia Albrecht, and Ewa Skoczylas for excellent technical assistance. This study was funded by SNF Sinergia grant CRSI33-125073 to PP. Capecchi, M. R. Gene targeting in mice: functional analysis of the mammalian genome for the twenty-first century. Nat. Rev. Genetics. 6, 507-512 (2005). Johansson, T., et al. Building a zoo of mice for genetic analyses: a comprehensive protocol for the rapid generation of BAC transgenic mice. Genesis. 48, 264-280 (2010). Skarnes, W. C., et al. A conditional knockout resource for the genome-wide study of mouse gene function. Nature. 474, 337-342 (2011). Carbery, I. D., et al. Targeted genome modification in mice using zinc-finger nucleases. Genetics. 186, 451-459 (2010). Meyer, M., de Angelis, M. H., Wurst, W., Kuhn, R. Gene targeting by homologous recombination in mouse zygotes mediated by zinc-finger nucleases. Proc. Natl. Acad. Sci. U.S.A. 107, 15022-15026 (2010). Cui, X., et al. Targeted integration in rat and mouse embryos with zinc-finger nucleases. Nat. Biotechnol. 29, 64-67 (2011). Sung, Y. H., et al. Knockout mice created by TALEN-mediated gene targeting. Nat. Biotechnol. 31, 23-24 (2013). Wefers, B., et al. Direct production of mouse disease models by embryo microinjection of TALENs and oligodeoxynucleotides. Proc. Natl. Acad. Sci. U.S.A. 110, 3782-3787 (2013). Wang, H., et al. One-Step generation of mice carrying mutations in multiple genes by CRISPR/Cas-mediated genome engineering. Cell. 153, 910-918 (2013). Urnov, F. D., Rebar, E. J., Holmes, M. C., Zhang, H. S., Gregory, P. D. Genome editing with engineered zinc finger nucleases. Nat. Rev. Genetics. 11, 636-646 (2010). ZFN, T. A. L. E. N. CRISPR/Cas-based methods for genome engineering. Trends Biotechnol. 31, 397-405 (2013). Joung, J. K., Sander, J. D. TALENs: a widely applicable technology for targeted genome editing. Nat. Rev. Mol. Cell Biol. 14, 49-55 (2013). Cermak, T., et al. Efficient design and assembly of custom TALEN and other TAL effector-based constructs for DNA targeting. Nucleic Acids Res. 39, (2011). Reyon, D., et al. FLASH assembly of TALENs for high-throughput genome editing. Nat. Biotechnol. 30, 460-465 (2012). Sanjana, N. E., et al. A transcription activator-like effector toolbox for genome engineering. Nat. Protoc. 7, 171-192 (2012). Kim, Y., et al. A library of TAL effector nucleases spanning the human genome. Nat. Biotechnol. 31, 251-258 (2013). Schmid-Burgk, J. L., Schmidt, T., Kaiser, V., Honing, K., Hornung, V. A ligation-independent cloning technique for high-throughput assembly of transcription activator-like effector genes. Nat. Biotechnol. 31, 76-81 (2013). Hsu, P. D., et al. DNA targeting specificity of RNA-guided Cas9 nucleases. Nat. Biotechnol. 31, 827-832 (2013). Fu, Y., et al. High-frequency off-target mutagenesis induced by CRISPR-Cas nucleases in human cells. Nat. Biotechnol. 31, 822-826 (2013). Hermann, M., et al. Evaluation of OPEN zinc finger nucleases for direct gene targeting of the ROSA26 locus in mouse embryos. PLoS ONE. 7, (2012). Meyer, M., Ortiz, O., Hrabe de Angelis, M., Wurst, W., Kuhn, R. Modeling disease mutations by gene targeting in one-cell mouse embryos. Proc. Natl. Acad. Sci. U.S.A. 109, 9354-9359 (2012). Doyle, E. L., et al. TAL Effector-Nucleotide Targeter (TALE-NT) 2.0: tools for TAL effector design and target prediction. Nucleic Acids Res. 40, 117-122 (2012). Miller, J. C., et al. A TALE nuclease architecture for efficient genome editing. Nat. Biotechnol. 29, 143-148 (2011). Guo, J., Gaj, T., Barbas, C. F. 3rd Directed evolution of an enhanced and highly efficient FokI cleavage domain for zinc finger nucleases. J. Mol. Biol. 400, 96-107 (2010). Doyon, Y., et al. Enhancing zinc-finger-nuclease activity with improved obligate heterodimeric architectures. Nat. Methods. 8, 74-79 (2011). Wefers, B., et al. Current Protocols in Mouse Biology. John Wiley & Sons, Inc. (2011). Wefers, B., Wurst, W., Kühn, R. Current Protocols in Mouse Biology. John Wiley & Sons, Inc. (2011). Haueter, S., et al. Genetic vasectomy-overexpression of Prm1-EGFP fusion protein in elongating spermatids causes dominant male sterility in mice. Genesis. 48, 151-160 (2010). Perez-Pinera, P., Ousterout, D. G., Brown, M. T., Gersbach, C. A. Gene targeting to the ROSA26 locus directed by engineered zinc finger nucleases. Nucleic Acids Res. 40, 3741-3752 (2012). Bultmann, S., et al. Targeted transcriptional activation of silent oct4 pluripotency gene by combining designer TALEs and inhibition of epigenetic modifiers. Nucleic Acids Res. 40, 5368-5377 (2012). Valton, J., et al. Overcoming TALE DNA binding domain sensitivity to cytosine methylation. J. Biol. Chem. 287, 38427-38432 (2012). Cradick, T. J., Ambrosini, G., Iseli, C., Bucher, P., McCaffrey, A. P. ZFN-Site searches genomes for zinc finger nuclease target sites and off-target sites. BMC Bioinform. 12, (2011). Byers, S. L., Payson, S. J., Taft, R. A. Performance of ten inbred mouse strains following assisted reproductive technologies (ARTs). Theriogenology. 65, 1716-1726 (2006). Luo, C., et al. Superovulation strategies for 6 commonly used mouse strains. J. Am. Assoc. Lab. Animal Sci. 50, 471-478 (2011). Pease, S., Saunders, T. L. International Society for Transgenic Technologies. Advanced protocols for animal transgenesis : an ISTT manual. Springer. (2011). Cong, L., et al. Multiplex genome engineering using CRISPR/Cas systems. Science. 339, 819-823 (2013).